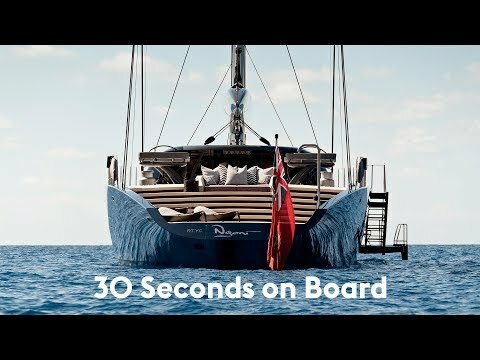 When Royal Huisman’s Project 398 was announced at the Monaco Yacht Show 2014, the yard revealed the owner’s brief: “Build me a beast. I don’t want a wolf in sheep’s clothing.” Three years later, we know what he meant by beast. 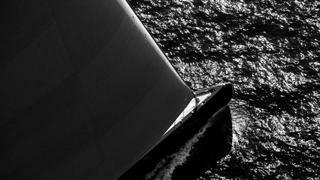 The Beast takes styling cues from Dubois’ racing boats and 66 metre Anatta (launched in 2012 as Aglaia), with copious amounts of glass defining her superstructure, but that’s where similarities end. Dubois’ enthusiasm was palpable when he presented the design at that press conference; its reverse sheer and bow shape were quite a departure from the status quo. 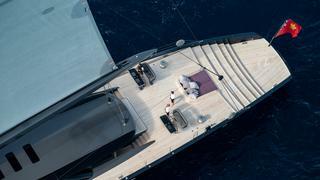 Although the designer would not live to see the yacht’s completion, his joy for something he considered truly visionary is a happy memory for all involved in the project. Ngoni — the word is the name for a people of eastern Africa and their language — is also unique for the non-traditional way she was managed. 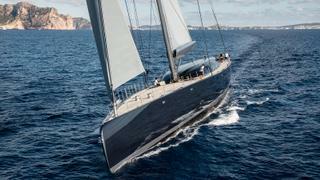 “It was a bit different for Royal Huisman,” says Cray. “Generally about a year into the build, a project focuses on rig and deck layouts, load factors being accommodated at that point. Cook, a British sailor who brought to the table 20 years of racing and cruising experience and seven years of captaining for Ngoni’s owner, shared the development and supervision equally with Cray. The owner told them to get on with it; he’d see them in three years. 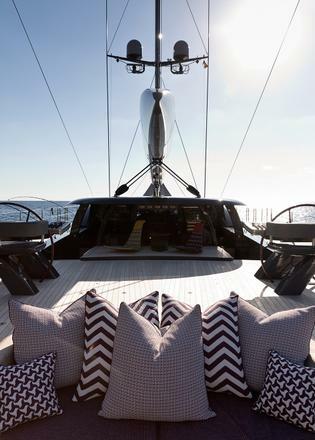 Londoners Rick Baker and Paul Morgan, who have created furniture pieces and design features for the owner for 20 years, were asked if they would design an interior around the GA developed by Cook, Royal Huisman and Dubois. They embraced their first yacht project unequivocally. “We planned an interior that is modern, organic and curved, following on the exterior lines. We know the owner likes curves and tactile finishes. It’s nice when you can be on the same page with a client,” Morgan says. “We approached it with a very open eye. 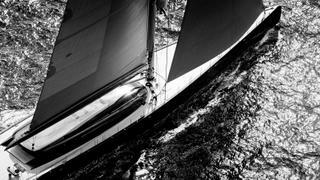 Royal Huisman was so helpful and there was a shared respect for craft. I think our concepts were eagerly awaited in the manner of wondering what we would come up with next. 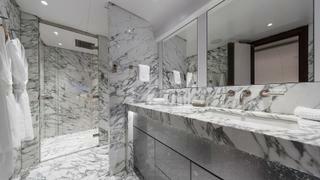 They kept us to a strict weight budget except for the marble in the showers and the wooden soaking tub,” he adds. To the description modern, curved and organic, I would add youthful and exuberant. Colours and art pieces — a collage of photos that becomes a seascape by Vik Muniz, a bust of a woman with an artichoke on her head and a Stefano Bombardieri sculpture of a rhinoceros suspended in air — could be talking points for days, but the real show-stoppers are wall panels commissioned by Officina Coppola, an English company specialising in custom finishes and art panels of resin, metal and limestone. The pieces are pressed into service as wardrobe doors and bedside wall panels; their colours and movement make it seem like you are looking at the bottom of a shallow sea. Indeed, contact with the water was key for the owner, which is why there is no superyacht sundeck. 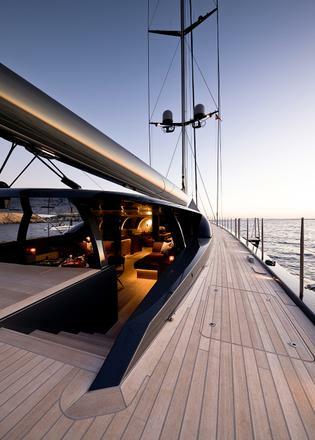 Ngoni’s main deck is completely encircled with optically perfect glass with exacting compound curves. Only one manufacturer, BCM in Turkey, would attempt the project. The glass, which is laminated with tinted film and heated to a near liquid state, is slumped into moulds to shape as it cools. The effect of the near 360 degree view from almost anywhere within the main deck structure is nothing short of awesome. The forward end of the glass deckhouse wraps around a navigation and communications console on starboard and a service pantry on port. In the centre of the open area is the top of the massive lifting keel box doing double duty as a chart table and staging meal service from the galley below. As if the curved glass wrapping around and over the coachroof frame isn’t enough, skylights give views of the towering mast above, creating an atrium-like effect on the crew space below. With the doors open, as they generally are, it is possible to see from the aft deck straight through the saloon and navigation station to the bow. 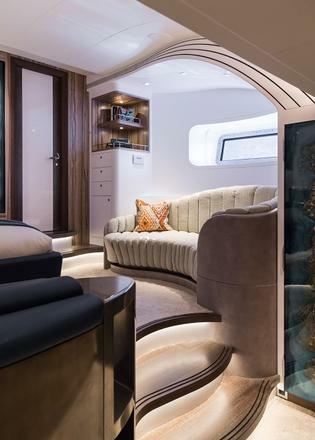 The open plan saloon — there are no internal supports — encompasses a dining table, a full wet bar with a backlit onyx top and custom bar stools matching the satinwood dining chairs by Francis Sultana, and a circular section for watching television or films from a small pop-up screen. Textures such as bleached wenge floor planks, the uniquely textured bronze-look “Boetti” bar front and matching staircase surround and coarse fabric on the sofa form a counterpoint to the glass and white painted panels. Elsewhere, highly figured Tabu and Alpi veneers and simple leathers form the backdrop to the passing scene. 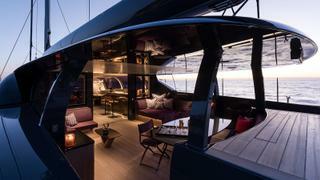 Aft of the saloon proper is an outdoor lounge with enormous L-shaped sofas under a hardtop that extends aft from the roofline. Sliding side windows can make this well sheltered in inclement weather or open to the breeze and it grants a great view of the dual helms. A 75-inch television monitor pops up from a cockpit counter for an al fresco cinema next to an outdoor dining table. 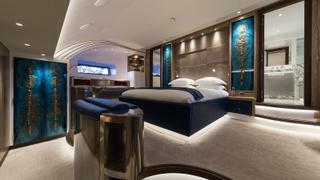 From the saloon a circular superyacht staircase descends to the accommodation and guest dayhead. 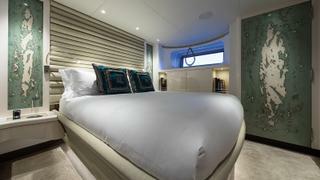 Two guest cabins benefit from being at the widest point of the yacht, just aft of the engine room. The rest of the lower deck accommodation is all owner’s suite. 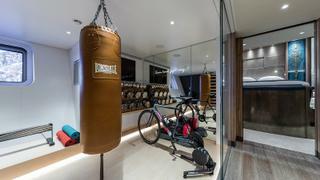 First up is a glass-walled superyacht gym with a maple floor. Opposite is the owner’s study, wrapped in turquoise leather and panelled with a striped engineered veneer the owner spotted in Italy. Niches display books and racing memorabilia. 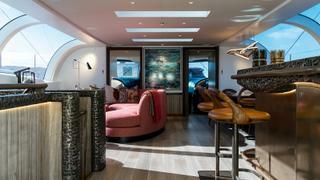 It is a chorus of curves from sofa to desk and pleasantly cocoon-like compared to the openness of the main deck. 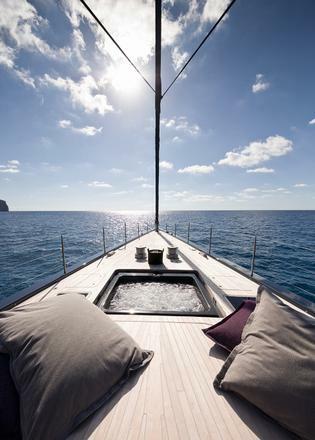 Furthest aft is the master suite, a double-height masterpiece of relaxation. The wardrobes and dressing area are on the same level as the gym and guest cabins but then, to gain width, the floor is raised three steps and this is the location of a stunning pewter free-form desk, a curved sofa and the master bed. The master bath is next aft but instead of being full beam, there is a small owner’s pantry to starboard with facilities for rustling up coffee, tea or snacks. 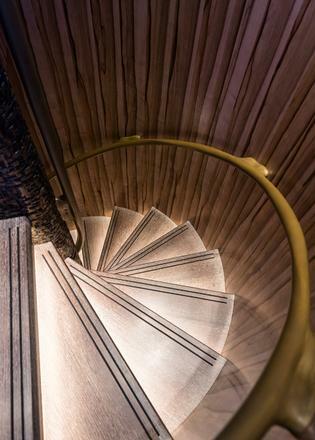 A secret staircase tucked in here provides access to the aft deck through a teak hatch. “The boss is up, has his juice and coffee and is off for a swim all independently. When he’s finished, he’s back to his suite without ever having to go through the saloon,” says Cook. Atypically for a yacht this size built today, Ngoni has direct mechanical steering via a quadrant, chain and cable. 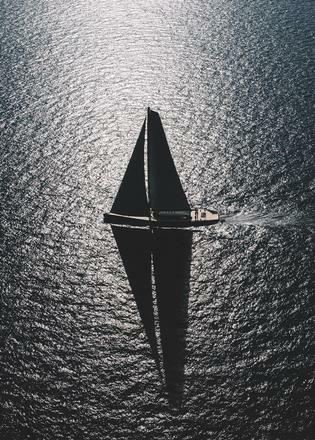 Royal Huisman engineered the system, putting considerable ingenuity into reducing friction at the various turning blocks in the mechanism. Considering the forces generated by the sails flying from a 72 metre Rondal mast, the request for direct rather than hydraulic steering necessitated thorough tank testing of the keel and rudder. 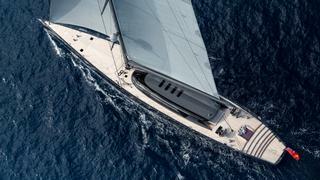 The stainless steel keel foil is shaped for delivering maximum lift to windward and the flattened torpedo bulb contains all the yacht’s 73 tonnes of lead ballast. 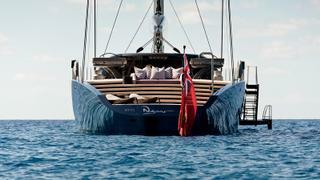 “The boat is perfectly balanced with just a touch of weather helm,” says Cray. Taking the helm as the boat cruises in light airs off the cliffs of Mallorca, I’m happy to confirm this and, as the last of the season’s sun turns those cliffs a deep gold, it’s impossible not to think of Dubois. At the press conference announcing the project in Monaco, his ultra-modern profile sketches induced gasps from the assembled press. Now three years later I’m the first journalist allowed on board. I look aft to admire the stairs stepping down to the sea, appreciating how Dubois’ career came full circle before he died. When he burst on to the scene in 1986 with Aquel II (now Philkade), people were amazed at the yacht’s open stern with steps down to the water. First published in the January 2018 edition of Boat International.